There aren’t many buildings left in New York like The Prince George that have maintained their luxurious historical roots once financial woes or disrepair became overwhelming. While many of these former architectural wonders have been reduced to faded and forgotten photographs or grainy film stock, some spaces are so sacred and awe-inspiring that outside organizations will do everything in their power to return them to their former brilliance. The Prince George Hotel, built in the Beaux-Arts style by Howard Greenley in 1904, was one of those destined-to-be-destroyed treasures as it sat decaying for years in the early 1990s on 28th street between 5th Avenue and Madison. Once a lavish hotel most notably known for being the first with private bathrooms in each room, The Prince George fell on hard times in the 1970’s when it was purchased and converted by New York City into a welfare hotel—one of the most dangerous and notorious in the city. This room featuring stunning arched ceilings, warm orange illuminated sconces, and Rookwood fountain and murals by George Inness, Jr., was used as a building storage locker. These rooms, originally designed with a cozy and quant English-style interior, had such destructive water damage that full restoration was deemed impossible. The magnificent 5,000 square foot Main Lounge with its Renaissance-style murals, full wall-to-pillar plasterwork, and commanding fireplace on top of a dark oak floor, was painted white, graffitied over, and used as a basketball court. In 1990, around the time that The Prince George was nicknamed “hell’s embassy in Manhattan” according to the New York Times, the city emptied the building of its 500 homeless families and let it sit empty and abandoned for seven long years as demolition seemed imminent. 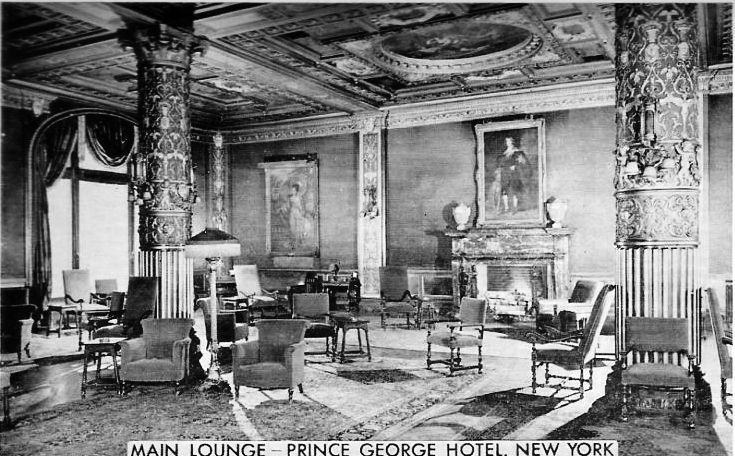 The Prince George’s second chance at recapturing its former elegance occurred several years later when the non-profit Common Ground, an organization dedicated to developing and sustaining supportive and affordable housing for the chronically homeless in New York, purchased the vacant building from the city—its second converted residence at the time. In collaboration with the Preservation League of New York State and New York Landmarks Conservancy, along with $39 million of private, state, and federal funds, Common Ground and Beyer Blinder Belle (the architects behind the Grand Central Station renovations) were able to successfully convert the decrepit building back into a livable residence with 416 single occupancy apartments. While the initial project financing helped transform The Prince George into a livable space again that met a societal need, it unfortunately was only enough to cover basic renovation rather than the work needed to restore the original decor of the once posh 14-story hotel. 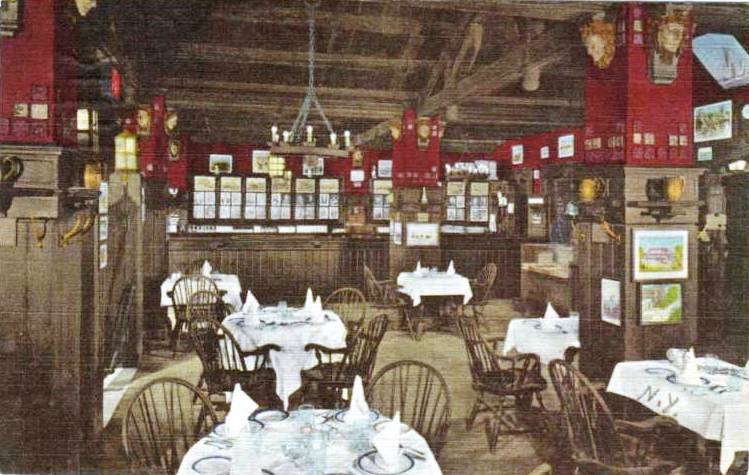 For six years, Common Ground tried to rent the Main Lounge space to commercial businesses, but given the poor condition of the room and strict historic preservation guidelines, no tenant was willing to restore the ballroom’s historic Neo-Renaissance architecture. In 2004, Common Ground decided they would partner with several private and non-profit organizations to undertake the momentous renovation task themselves and rent out the completed The Prince George Ballroom with 100% of the profit feeding back into their non-profit organization. After realizing they could utilize the ballroom themselves, Common Ground once again partnered with Beyer Blinder Belle to organize rehabilitation efforts for the ballroom and former Hunt Room. While the Worlds Monuments Fund financed the transformation of the Hunt Room into a modern gallery space, Common Ground took on the massive ballroom restoration project with the help of youth architectural apprentices from vocational high schools, students interested in restoration arts, and a host of other youth organizations. This project wasn’t just about helping the building achieve its previous grandeur—it was about presenting at-risk young adults in New York with the opportunity for needed training, jobs, and a chance to make a noticeable difference in their home city. Over the past 24 years, Common Ground has become the New York metropolitan area’s largest developer of supportive housing, managing 16 transitional and permanent housing residences that have enabled over 5,000 people to overcome homelessness. Tenants are now comforted to have a permanent place to call home and are assisted through a team of incredible staff members and social service agencies that provide job placement, health services, and case manager services. The non-profit’s dedication to helping the chronically homeless assimilate back into a normal living environment, improve their health and wellbeing, and obtain social assistance benefits, has successfully resulted in keeping the eviction rate of buildings like The Prince George to under 1%. Common Ground has not only transformed the lives of the tenants living in its nearly 3,200 units scattered throughout New York and Connecticut, but also of its countless community members who have responded to seemingly impossible tasks, like The Prince George renovations, with an amazing sense of collaboration and collective outreach. The Prince George was close to being a story that ended in neglect, anguish, and destruction—but instead, it is now a story of collaboration, opportunity, and revival. Want to see The Prince George in person? Join the New York Adventure Club as they get an exclusive guided tour of the entire building including the World Monuments Fund Gallery, Ladies’ Tea Room, and the completely restored ballroom. All you have to do is join the group on Facebook and grab a slot when the tour is officially announced in the next several weeks.